At least two tornadoes struck New Haven County the afternoon of the 15th. 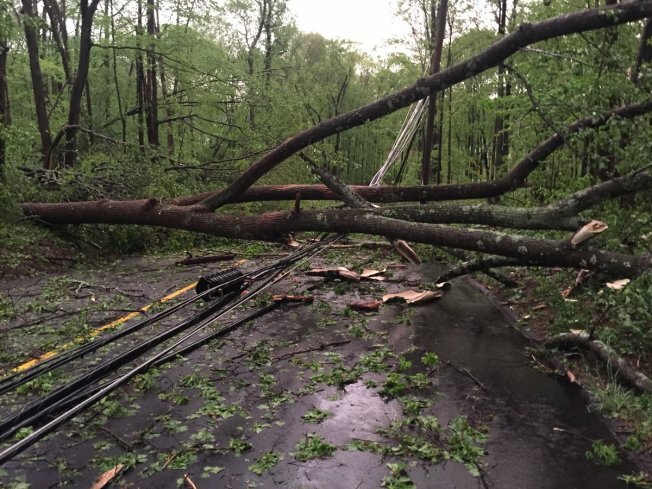 The first tornado touched down near Bullet Hill Road in Southbury and continued into Oxford. A second tornado developed near the center of Beacon Falls and continued into the hills of Hamden to the west of Route 10. Approximate tornado path in Southbury and Oxford. Approximate tornado path in Beacon Falls, Bethany, and Hamden. The two tornadoes were within a path of destructive straight line winds. There could have been several more spin ups that we'll never know about. 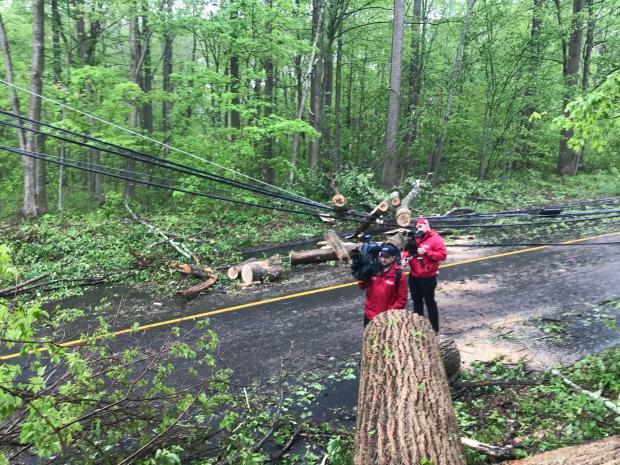 Some of the areas hardest hit like Bullet Hill Road in Southbury, Hogs Back Road in Oxford, and Fairwood Road in Bethany had clear tornado damage with countless snapped trees. Elsewhere, a large area of damaging wind produced exceptional damage. On radar this storm had a clear evolution from a supercell to a bow echo - in other words a storm that transitioned from one producing a tornado to one producing straight-line winds. Trying to distinguish between the two is challenging to say the least. Radar valid at 4:54 p.m. showing strong rotation over Southbury. 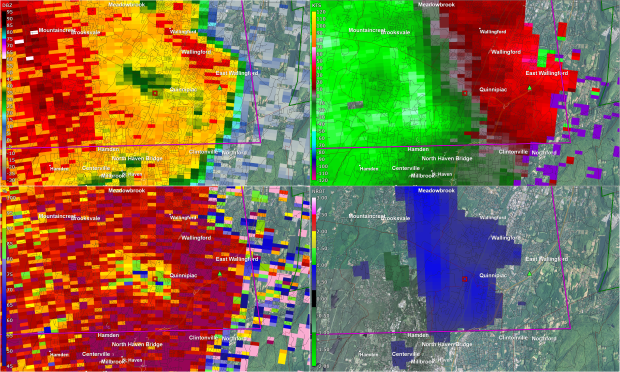 the upper right panel is base velocity showing winds away (red) and toward (blue) the radar site on Long Island. The destructive winds in Newtown moved over the Housatonic River in Southbury and quickly spun up a tornado. It's possible that the winds near the ground were locally backed (out of the southeast up the river valley) which lead to a very localized increase in shear. This could have been enough to spawn the tornado just east of the river near Bullet Hill Road in Southbury. 4:58 p.m. showing a tornado debris signature that appeared just south of Southford where lofted tornado debris was detected by radar. This shows up as low correlation coefficient (the blue in the lower left panel) that was coincident with strong rotation. After the tornado touched down around 4:54 p.m. we detected a tornado debris on radar at 4:58 p.m. This was a first in the Connecticut TV market as we were able to see lofted debris on Doppler Radar live on the air moments after the tornado touched down in Southbury. 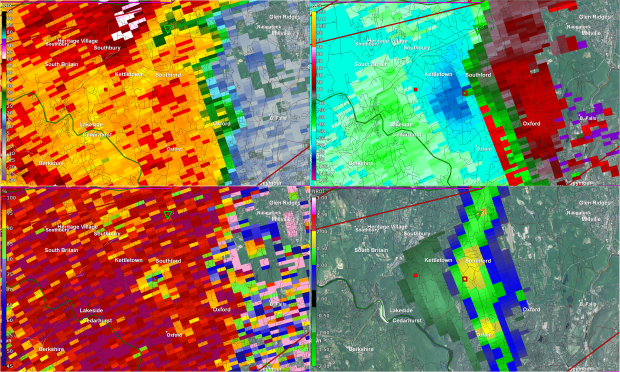 There was a clear debris signature just south of Southford. 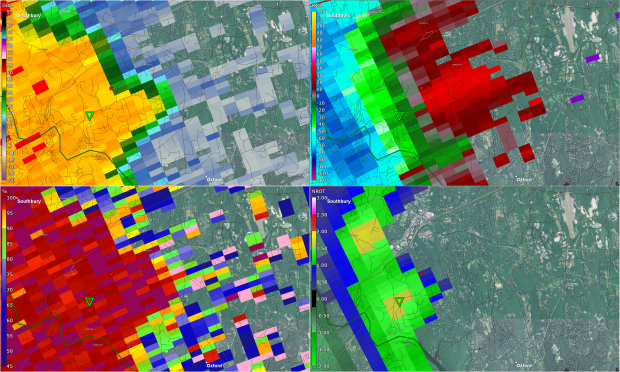 Dual polarization radar allows us to determine what kind of targets the radar beam is hitting. Whether it be big rain drops, small rain drops, big fluffy snowflakes, tiny snowflakes, hail, smoke particles, bugs or tornado debris - each target has a unique signature. In this case pieces of leaves and twigs were being lofted by the tornado into the storm's updraft. This gave us clear evidence so we could confirm a tornado had touched down. The first tornado over Soutbury and Oxford lifted and a second tornado touched down over Beacon Falls. There were several areas of rotation and it's possible more than one tornado touched down. The tornado reached its peak intensity over Bethany around Fairwood Road and in the western hills of Hamden. Tornado damage in Bethany on Fairwood Road. A second tornado debris signature occurred over Bethany as the tornado strengthened. There was a large area of powerful straight-line wind damage in Bethany but a somewhat narrow tornado path on the south side of Route 42 and over Fairwood Road. The damage on Fairwood Road was exceptional. The peak intensity of this tornado was an EF-1 or 110 mph. Beyond Bethany the storm's rotation began to weaken and the tornado lifted quickly in Hamden. 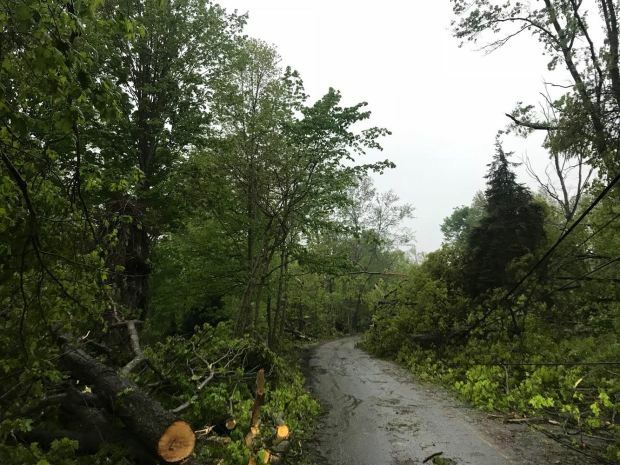 When the tornado lifted a powerful swath of damaging winds continued from Sleeping Giant State Park to Wharton Brook State Park in North Haven and then into Wallingford and Northford. As the storm's rotation weakened the storm became "outflow dominant" with the Rear Flank Downdraft of the storm rushing east and producing winds of up to 100 mph. Widespread wind damage in Hamden. Large area of "debris fallout" over Hamden as the storm transitioned from a tornado to one producing strong "straight-line" winds. You can see the debris in blue on the lower left panel and in the upper left panel you can see a classic "bow echo" as the storm's powerful downdraft forced the storm to "bow out". As the apex of the bow reach Sleeping Giant and Wharton Brook State Park winds of 100 mph snapped trees in a large area. On radar the somewhat "tight" rotation over Bethany became more broad over Hamden. What was interesting is that the debris lofted into the clouds from the tornado in Bethany fell out of the storm over Hamden. We could detect the tornado debris falling out of the storm as it crossed Route 10 and headed into North Haven. Hamden is certainly no stranger to tornadoes. The damage from the May 15, 2018 storm pales in comparison to what was done during the July 10, 1989 F4 tornado that swept houses in Newhallville clean off their foundation. 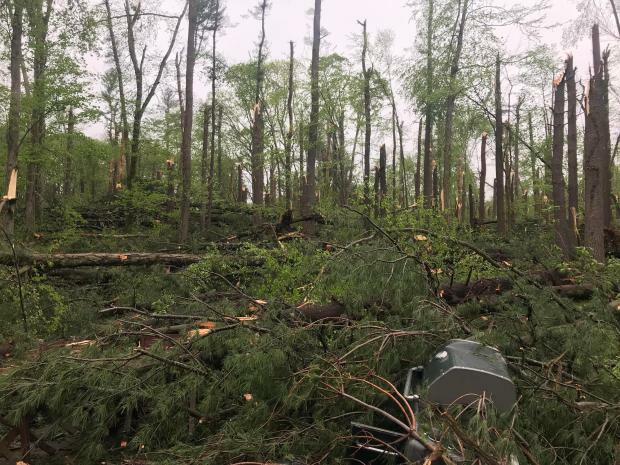 Still, the damage from this storm across a large chunk of New Haven County is some of the worst the state has seen from a thunderstorm in quite some time.